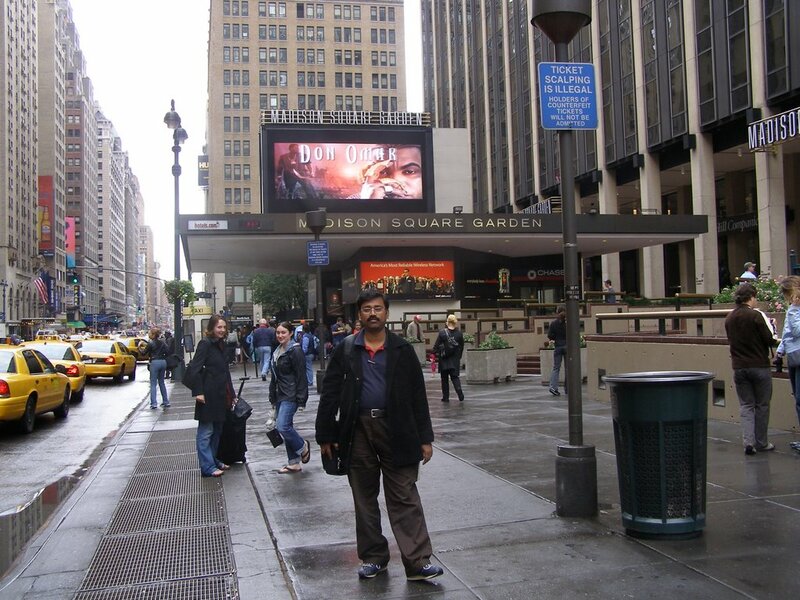 New York - Land of dreams | Me, in Me. Our next destination in this challenge is New York, Land of dreams. 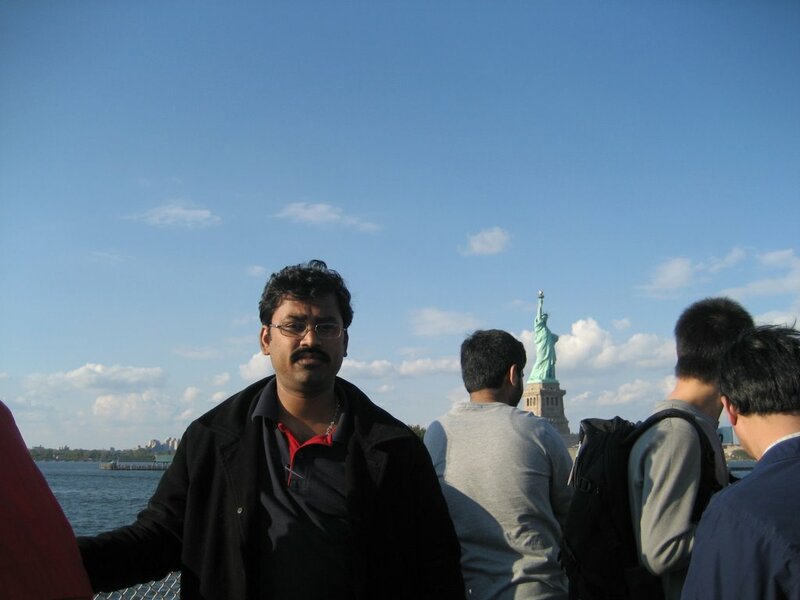 My first trip outside India was to the United States of America. And I landed there on 01-01-2001, what a memorable date! I am halfway through the challenge and did not write about the first ever country I visited. Not at all fair. So, here we go, to New York. 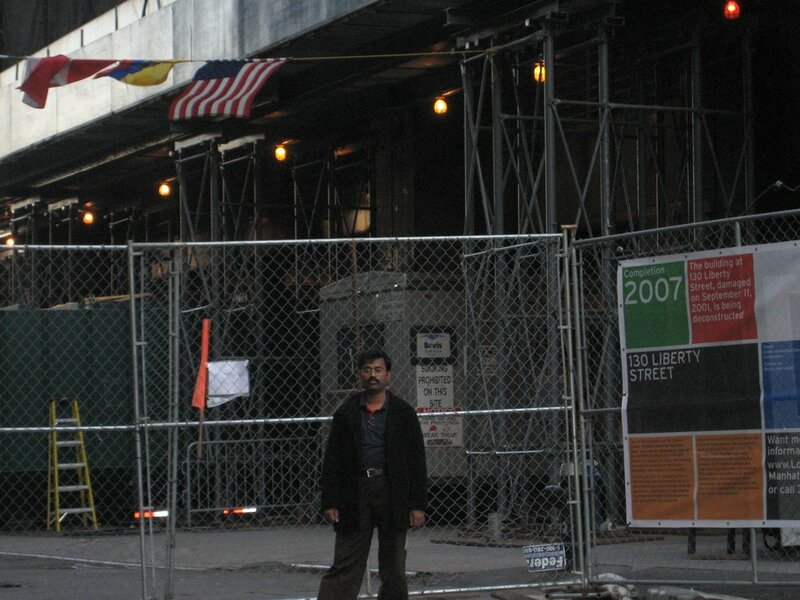 My visit to New York happened around September 2006. Since most of my travel is business related, its hard to plan for any personal fun. But sometimes it does happen that things will reveal without any plans. One such occasion happened when I was visiting Malboro. One fine week I talk with my friend in Illinois. 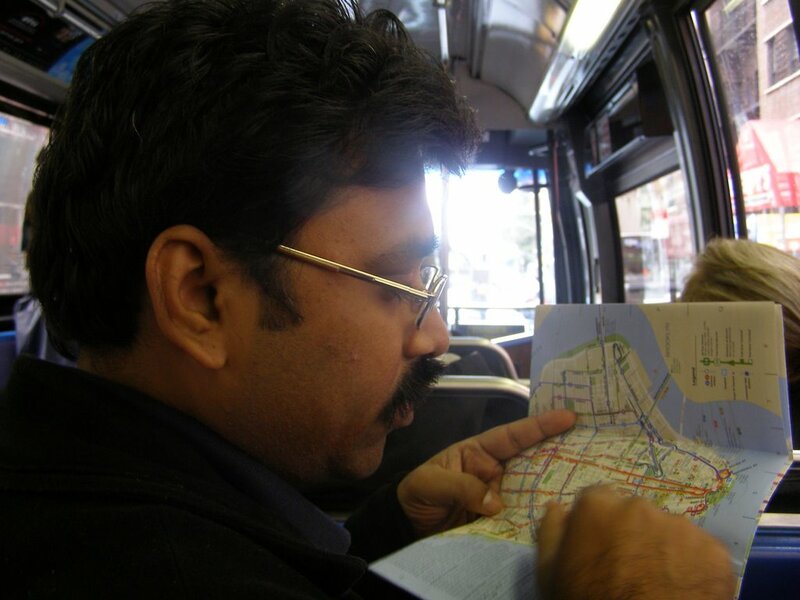 We were talking about where to meet and all of a sudden, we narrowed down to New York City. And here we are, in the streets of New York. We had no plan on where to go, what to do and where to stay. But we were there. Picked up some maps from the tourist information center in the station and started to walk. We started to walk in the street. 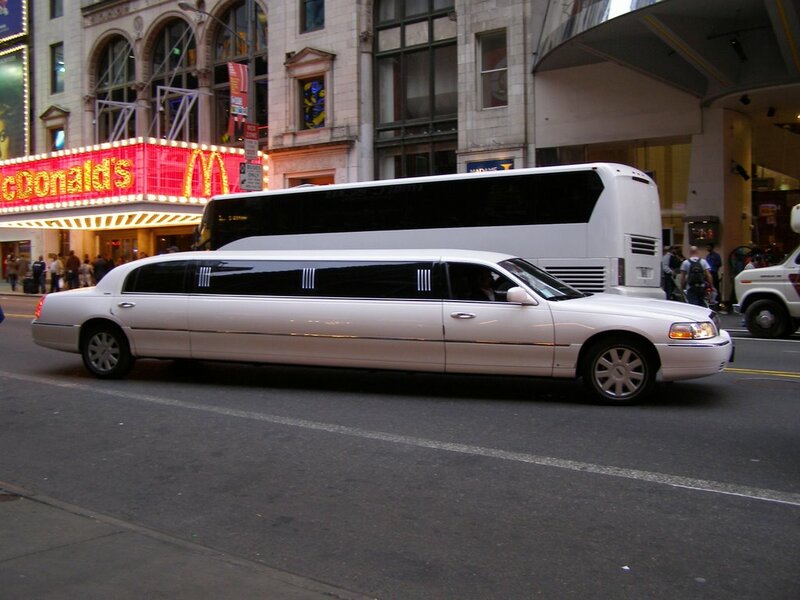 You know you are in New York City when you see those limousines and yellow cabs everywhere with no place to walk and a MacDonald illuminated with lights like crazy! But still, picked up my favorite Caramel Macchiato from the Starbucks. How can one miss this in the US? So, had some refreshments and started to walk briskly. 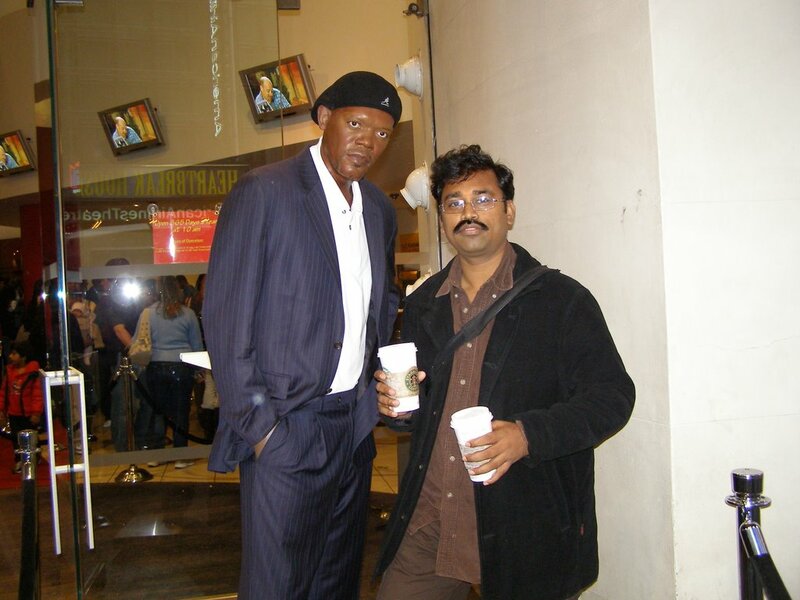 While walking, we noticed this Madame Tussaud’s New York Wax museum and here goes the photo session. Then we moved to the Empire state building. We could not make it to the top since it was little late and kept it in the plan for some other day. But still, what’s a visit without pictures. 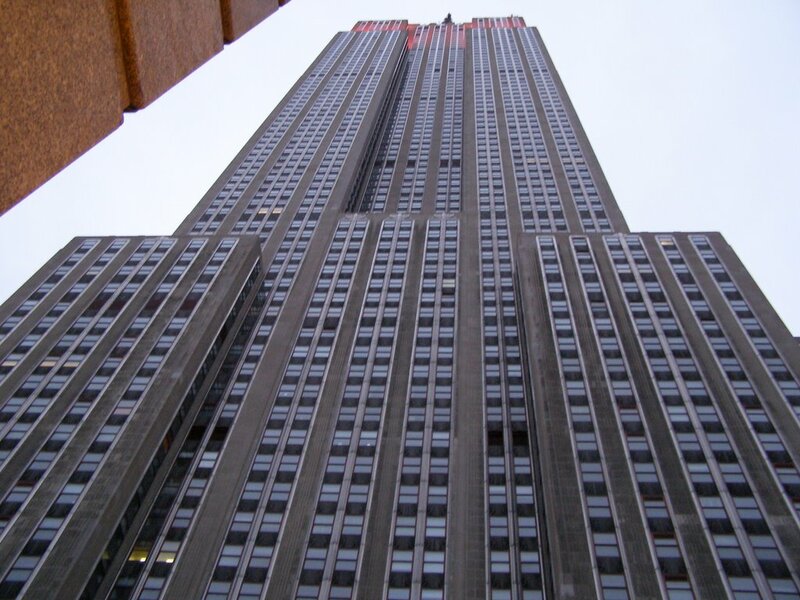 So, here is the Empire State Building. Now we were fully exhausted and so it’s search for public transport time. Picked up a bus and headed to the island based on the tourist map. Finally, we arrived at the Statue Cruise starting point on New York. I see everyone taking pictures of the skyscrapers around that place. And when our cruise is ready, we get on board. Hey Lady, here we come. After an exhaustive security checkup, we started our venture. And then I present you the glimpse of what we saw there. 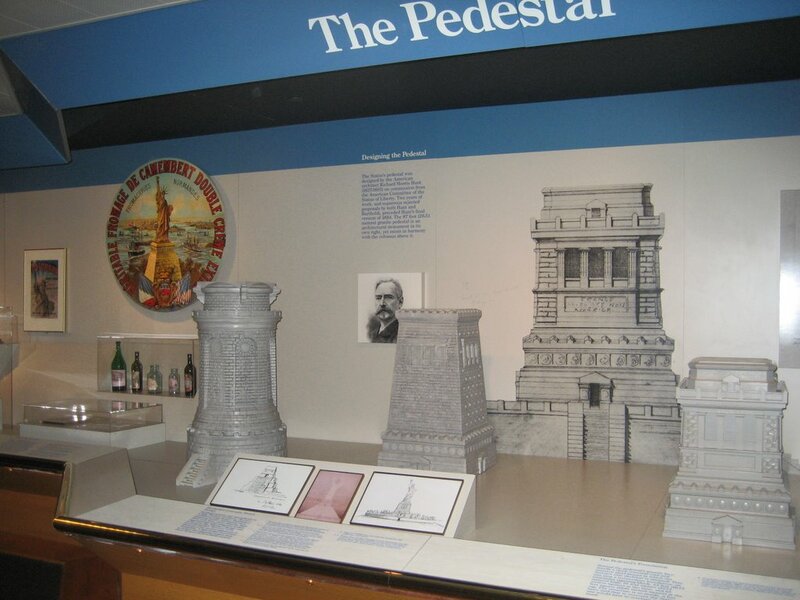 Before you enter the Pedestal, you will be passing through the Museum of Statue of Liberty. From the entrance, there is a large room, at the center of which is the torch of the statue. 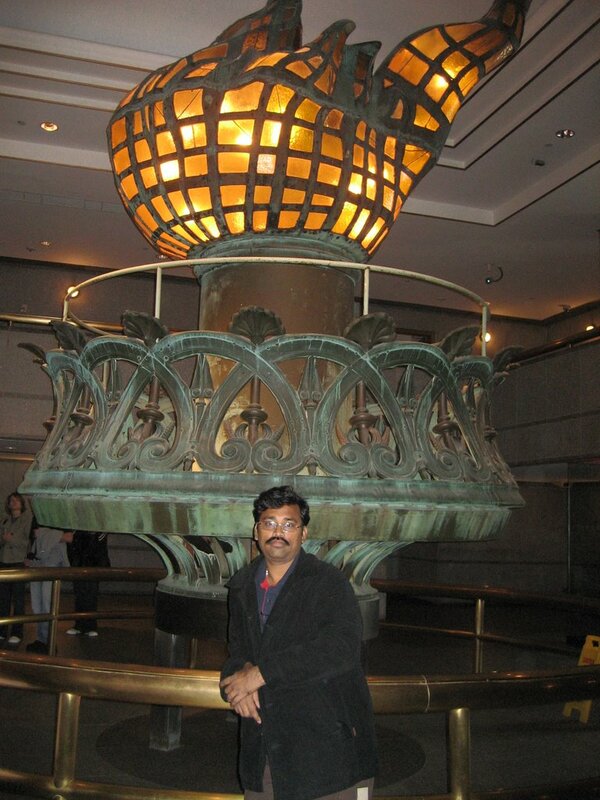 This is the original torch which was decorating the statue for almost 100 years and then replaced with a new one. 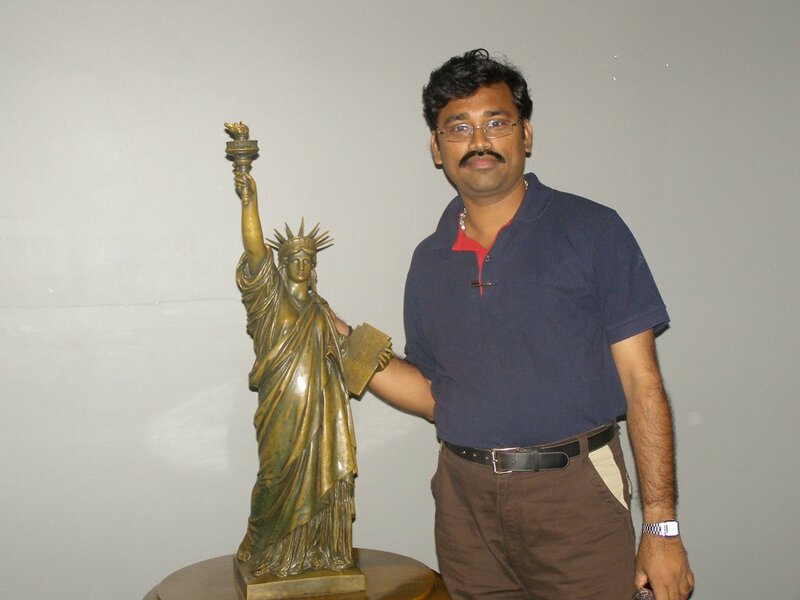 The old torch rightly found its place in this Museum. A balcony goes around the room and the visitor can see this large object from the ground or above. Hey, this torch is too big to fit in my hand. So, posing in front of it. When you reach the 2nd level you will be almost at the flames of that torch. Walk further to face the face of the statue. 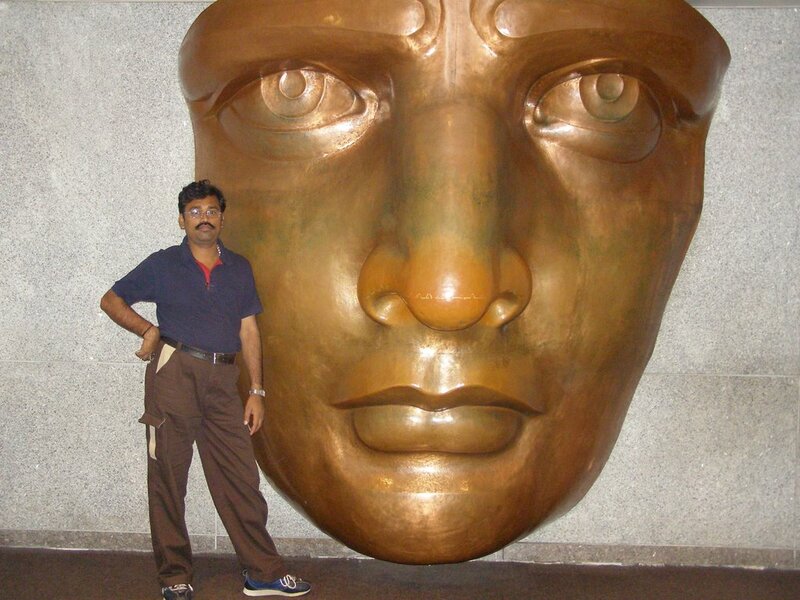 I mean the copper replica of the face of the statue. This is obviously the color of the copper, but our lady glows in green due to the natural oxidation of copper. 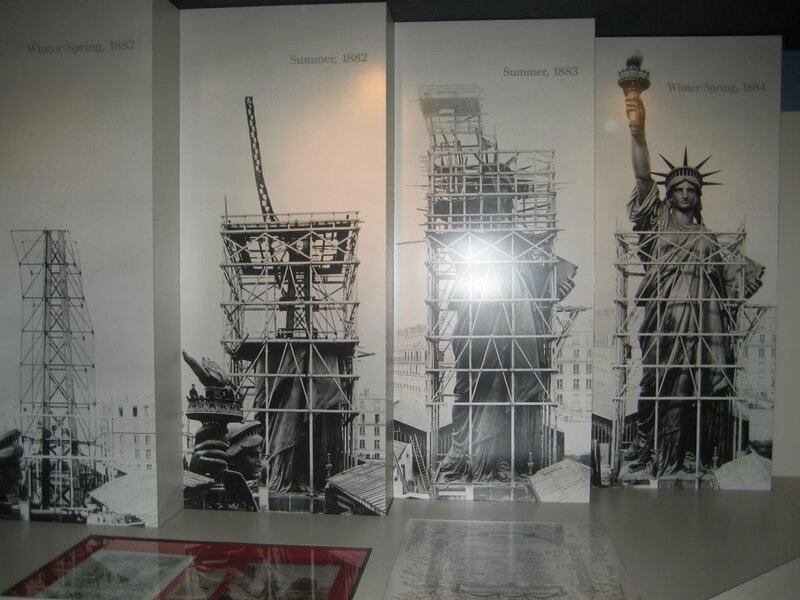 Many pictures of the construction are displayed to give an overview of the progress and each stage of the construction in detail to the visitors. 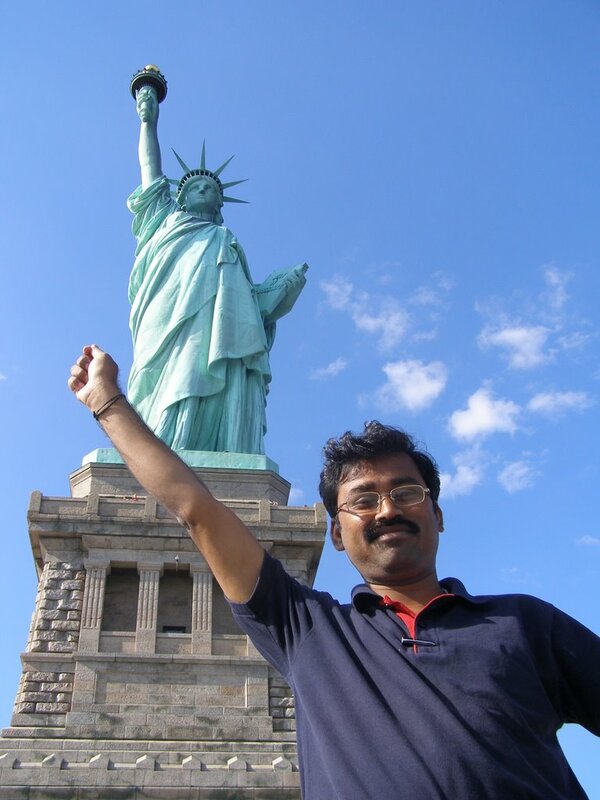 Sort of making of the statue of liberty. Once you are on the pedestal you will find the path to get into the Statue. When you reach the higher level, do not miss to look on top through those glass ceilings. You can actually see the metal architecture that holds the statue from inside. From the top of the pedestal, you will have a very nice view of the New York bay. Enjoy as long as your excitement takes a leave. How can I restrain myself from posing with the Lady? And so here you go. Just the torch is missing. But I am sure even if I had a torch in my hand, I would have been landed straight into the bar. After all those excitement, we did make a visit to the place where once the World Trade Center Twin Tower was decorating the Manhatten. Sad to see and read those horror stories. But its reality – we do have animals roaming among us on the cover of humans!!! There are many controversies in this terror act – hey who cares. We lost lives and 1000s of it. My theme for the April 2018 #AtoZChallenge is blogging about the places I have been to. Let me see if I can make it through all alphabets. You can find all my #AtoZChallenge posts here. Interested to know my next destination starting with letter O? Try commenting your guess, let’s see. Are you participating too? Comment your themes here. Good luck. Thanks. 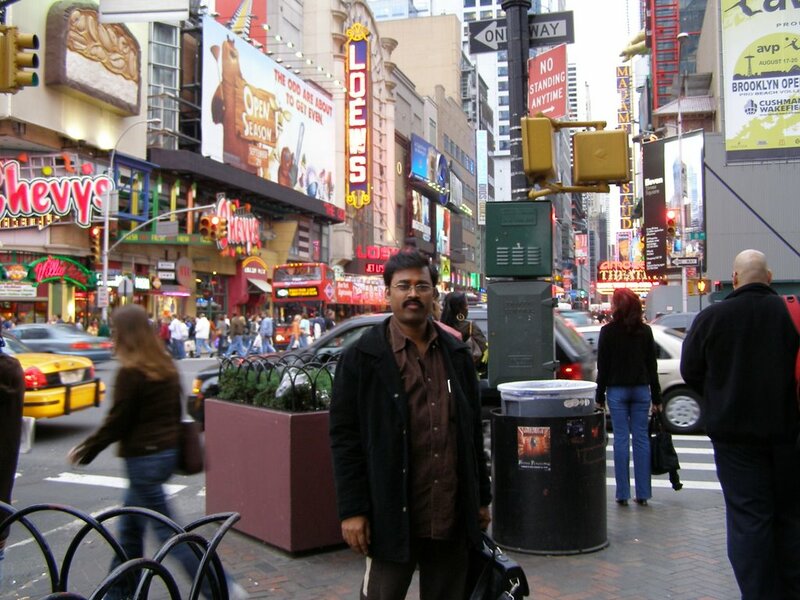 Yes, my memories of New York is also mainly from Hollywood movies. I missed to include those trains on bridge etc which was also really nice. Thanks Shilpa. Actually, stay away for Manhattan, and you will have plenty of road side options to try delicacies from different parts of the world. Esp the path under those train bridges! 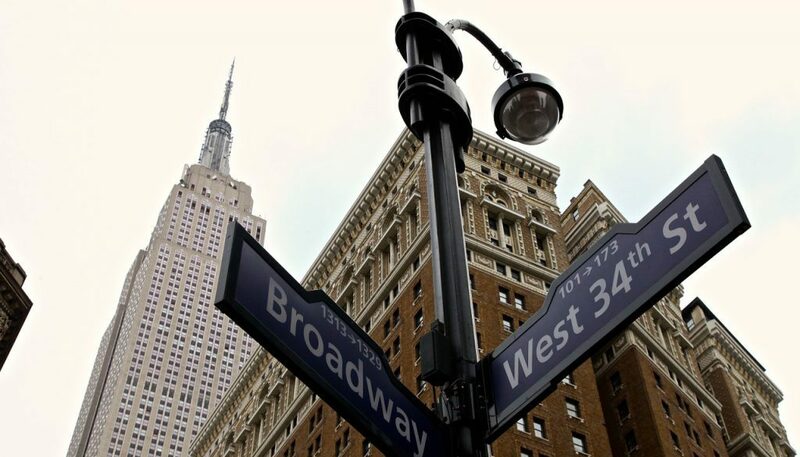 NYC is a wonderful place to visit, and there is always something new to see. I’m glad you were able to visit the places there that you did! Thank you. I agree, I am looking forward to plan a visit sooner. Hope it materializes. Its popular for a reason. Check out!